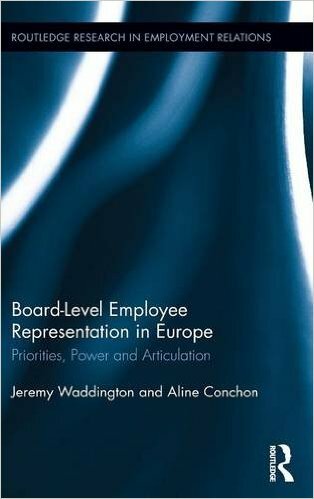 서명/저자 Board-level employee representation in europe : priorities, power and articulation / Jeremy Waddington ; Aline conchon. 발행사항 New York ; London : Routledge , 2016. 서지주기 Includes bibliographical references, appendix and index. Based on a large-scale survey distributed to board level employee representatives (circa more than 4,000 respondents), this study identifies the personal characteristics and industrial location of board level employee representatives, what they do and how they interact with other parties within and outside of the company. This study fills in a knowledge gap at a time when policy debates are considering stakeholder models of corporate governance as a means on the way out of the crisis and the achievement of sustainable economies. The book allows direct comparisons between clusters of countries for the first time, as the same survey instrument has been employed in all the participating countries. The research findings demonstrate a large variation in what constitutes board level employee representation in practice, including the relations between board level employee representatives and parties within and external to the company, and the pattern of influence of board level employee representatives on strategic company decision-making. Aimed at practioners, researchers and policymakers alike, this book makes a vital contribution to the field, and will be the definitive work on board-level employee representation for the foreseeable future. 7. Conclusion: What Does All This Mean?